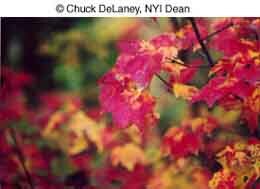 There is perhaps, no more pleasant outdoor photography adventure than the pursuit of the colors of autumn. 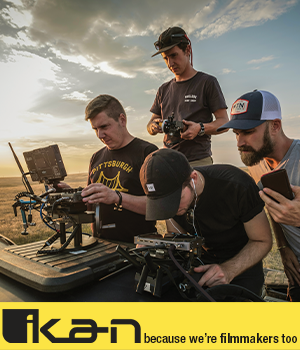 Let's modify that – certainly no more solitary outdoor photography adventure exists. Frolicking in the woods with a model or two might strike some as even more pleasant. Granted, there certainly are greater outdoor photography adventures, including many grueling and more dangerous ones. 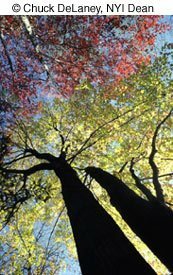 But a trek in a hardwood forest on an autumn day – morning, afternoon, or evening – with camera in hand, is hard to beat. Another plus: the subject matter is very accessible. For photographers who lack great mobility, fall colors are within reach. Simply put, autumn photography is both pleasant and easy. First and foremost, you're outdoors during one of the absolutely finest seasons of the year. As the long, languid days of summer start to wane, the humid, sometimes foggy mornings of August and early September gently give way to the crisp, clear, low humidity days of fall. Even if you don't record a single image, you will be the beneficiary of a marvelous day out of doors. Second, the riot of fall colors created by the last gasp of the leaves of deciduous trees creates a scene that is easy to capture with your camera. There are many outdoor settings that are awe-inspiring to the beholder in the moment, but elusive when it comes to recording them on film. Not so with fall color. You have an infinite variety of options. Vistas, close-ups, mid-range photos with a portrait subject in the foreground – all present exciting possibilities. Third, and perhaps best, there will always be the one that got away. If this seems overly philosophical, you simply haven't taken enough photographs. When your files are filled with fireworks, and you have pictures aplenty of your nieces and nephews, there's always room for more fall color. The shifting combinations of color and weather never cease to amaze. With regard to the last point, the subject matter is more than just "fall color." It would be more accurate to describe it as the departure of one season's leaves in preparation for those of the next. 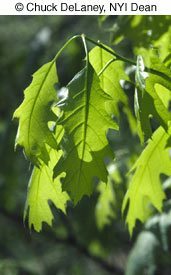 I'm glad to remind you that there are a few feisty trees – some oaks and a few others – that refuse to yield to the inevitable onslaught of winter. 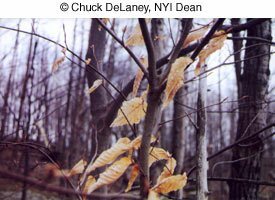 They keep their leaves affixed through fall storms and winter's ravages, only dropping last year's withered brown or tan leaves when the buds of the new growth finally push their predecessors off the tree in early spring. Because of this stubborn persistence, I photograph "fall color" all through winter, into the final "drop off" in early spring. As time goes along, fall color just gets duller. The desiccated brown leaves, still clinging to spindly branches in the dead of winter or the pale gray-brown of early spring, are just the final chapter to a story that begins with fall's riotous color. Words used in both the Land Before Time animated dinosaur adventure series that captivated (me and) my daughter and Disney's Lion King, "it's all part of the great circle of life," an apt and well-turned phrase. We might say the circle starts in the spring when the new leaves appear. Those wondrous leaves, screaming light fresh green in spring, turn to a bug-bitten darker green in summer. Then comes the fall. 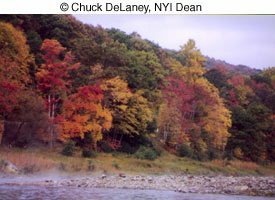 As the days shorten and the cold weather begins, the chlorophyll retreats from the leaves and many exhibit a residual, almost angry coloration governed in part by species and part by the combination of summer and fall weather. How long does the exhibition last? How good does the show get? Why can't we improve on that uncertainty? Sorry, our digital world can perform a lot of miracles, but computers still can't make airplanes land in deep fog, or make fall any more vivid than Mother Nature and weather conditions will allow. Well, first of all, it depends on the onset of cold weather in relation to the colors of different trees. 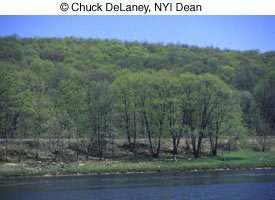 In the northeast, the color starts with the aspens and birches, then spreads to the maples. Finally, and it's always a breath-taking wait to see how soon, the oaks take their turn center stage. 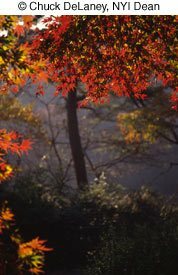 In a good season, the oaks light up in rich reds and yellows. Some years they don't. Instead, they go straight from green, to brown, to on the ground. In a better season, the oaks light up while the maple, birch, aspen and hickory leaves are still lingering on the trees. In a heartbreaking season, a nasty wind-and-rain storm knocks down the maple, birch, aspen and hickory leaves before the oaks even make up their minds. In the very best of all seasons, it all happens right on schedule, in front of your face and you get a day or two to get out there with your camera to try your hand capturing the best of fall color. Where can I photograph fall color? While New England is billed as the epicenter of fall color, that's as much a credit to the tourism industry of these states than it is to reality. It usually starts in New England, but there are great displays in New York, Pennsylvania, and Ohio, as well as Mid-Atlantic States such as Virginia, Tennessee and West Virginia. Hardwood forest stands across the Midwest yield plenty of opportunities, as do the mountains of the West: the Sierras, Rockies and the peaks of Utah. Northern California and the Pacific Northwest also have displays that can yield marvelous photographs. In short, there are lots of opportunities. In fact, the best place to photograph fall color is probably the place that is most accessible to you. It's better to be able to come back to a scene from time to time so you can take pictures while the color emerges, and take advantage of different times of day and lighting conditions. 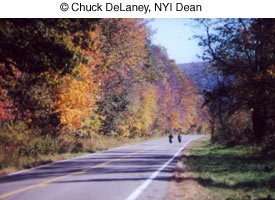 Why does fall color happen? Can we review the scientific details? Basically, all you need are hardwood trees and enough cold weather to go with the short days to make for bright fall colors. Remember, the shorter days signal trees that it's time to go into rest mode. All summer long, the leaves have been making food via photosynthesis. It's worth a few sentences to review this elementary science lesson. The leaves use photosynthesis to turn water and carbon dioxide into glucose, a sugar that the trees use as food for growth. 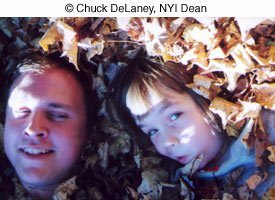 Like film or a CCD chip, leaves are light sensitive. It's chlorophyll in the cells of leaves that absorbs energy from sunlight and makes photosynthesis occur. Chlorophyll is also what gives leaves their green coloration. During the summer, trees make more glucose than they use, so some is stored for the winter. When fall approaches, the production of glucose slows and then stops. Moisture stops flowing into the leaves, and the chlorophyll breaks down. When the green of the chlorophyll disappears, we see the other colors caused by various pigments – carotene (orange), xanthophyll (yellow), and anthocyanin (red and purple). These are all common pigments found in plants, such as beets and apples, as well as flowers. When is the best time of day to photograph fall color? There's no bad time of day to photograph fall color. As with most landscape work, the morning and late afternoon often provide the most interesting shadows. As veteran travel photographer Susan McCartney often points out, "It's best to photograph outdoors when your shadow is longer than you are." Early morning may bring fog or mist that will provide a soft background, along with long shadows. The rich golden light just before sunset transforms not only leaves on trees, but those on the ground as well. However, there are also opportunities mid-day. 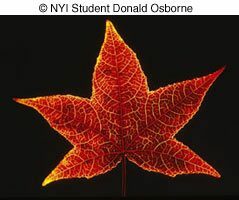 With the sun overhead, you can use backlighting to make leaves glow in your photographs, as in the photo above. Notice how the warm late afternoon light, coupled with the long shadows turns this field into a rich pattern of color. 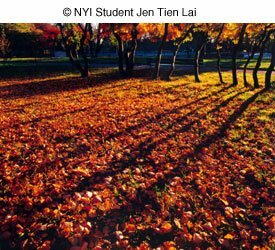 What is the best lighting and weather for fall color? Once again, it really doesn't matter what kind of lighting you encounter. Each type of lighting offers different opportunities. If it's sunny, you get the benefit of blue sky and strong light and shadow. However, when the sky is overcast or when clouds obscure the sun, you get the benefit of enhancing the colors of the leaves relative to the rest of the surroundings. 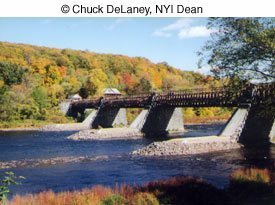 This photo uses fall color and a blue sky to create a very striking background for an historic 19th century bridge on the Delaware River. Notice how the sun casts strong shadows on the stone base of the bridge. 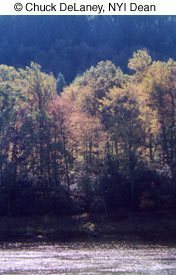 The direct sun falling on the hillside on the far side of the river illuminates the fall color in flat light. This photo, below left, was taken with the sun high overhead and slightly behind the trees. 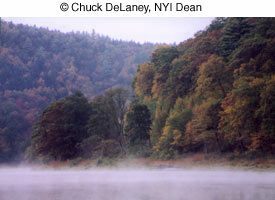 A warm mid-day haze adds to the feeling of the photograph and mutes the colors of the leaves and the hillside behind, while creating bright highlights on the river at the bottom of the scene. By finding the right angle, it's possible to use backlighting to highlight a colorful tree against a muted background. It makes sense to walk around and look for angles that add this type of drama to a photo, such as this image above right taken one November in the Emperor's Garden in Tokyo. Fall color isn't limited to America. A heavy leaden sky can make subtle colors pop. 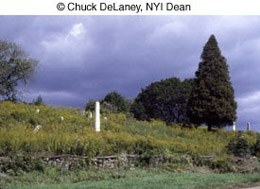 On the left below, a field of goldenrod has taken over a small country cemetery. 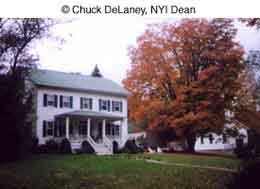 To the right of that, a country Bed and Breakfast is brightened by the overall orange hue of the maple tree in the front yard. The combination of the Inn and the tree assure that the dull gray sky behind is not that prominent in the scene. If you look closely at this photo, you'll see that the top of the maple is starting to thin a bit, a factor which raises the question of timing. It is a good idea to start taking pictures as soon as the leaves start to turn. If a heavy frost comes along, or a big windy rainstorm, color can wane quickly. The frost will actually diminish the color, and the wind will rip the leaves from the branches. 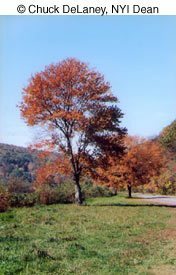 In addition, once leaves start to fall out of the trees, many trees, particularly maples, will start to have a threadbare look. This starts at the top of the tree, and while you may not notice it when you gaze at that bright crimson color, it will show up in your photograph. Is it a good idea to use filters when taking pictures of fall colors? Some photographers use a polarizing filter when photographing scenics for two principal reasons – to darken and enrich the blue of the sky, and to cut the glare on water. 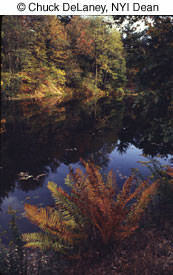 The latter can be particularly helpful if you're trying to show the reflection of fall color in the water. There are special filters called enhancing filters, or intensifying filters, that can enrich reds and yellows. These can be quite costly, and are not really necessary in most instances. Rely on your own eye to find good lighting situations and color combinations. None of the photographs that appear in this article were taken using filters. What about close up photos of leaves? This depends on the way you handle the situation. As we mentioned before, those fresh, bright green leaves of spring suffer a lot of wear and tear as summer and fall come along. The close-up of a branch of a sugar maple on the left shows that almost every leaf has a small hole or tear caused by insects, or sometimes scampering squirrels. Those minor imperfections won't show up in scenic views, but if you're interested in detail work, you have to look carefully to find a leaf that exhibits interesting color and is also in good shape. The photo on the right was made indoors with studio lighting to backlight the specimen and set it off against a stark black background. Can I make portraits in fall color? Sure, why not? Just make sure that a riot of color doesn't violate NYIP Guideline Three by diverting the viewer's attention from your intended subject. While we're on the subject of Guideline Three (Is there anything distracting in the image? Is there anything I can do to simplify my photograph? 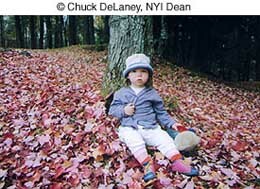 ), remember that you should watch out for distracting elements in all your fall photographs. It's easy to get carried away by the beautiful colors all around and the crisp, clear air and fail to notice the telephone pole, wires, or stop sign that will be all too apparent in your photograph. I tend to work with subjects and the leaves on the ground, rather than posing people in a setting that features lots of bright trees. 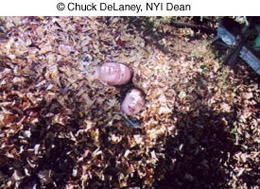 Nothing wrong with raking leaves into a pile and getting some playtime in when you're done taking pictures. Don't hesitate to get in tight for a close-up now and then. To conclude our fall photography tips, let me leave you with the same notion I raised at the start: There's nothing finer than a fall day outdoors. Get out there with your camera and enjoy!